Feather collar necklace, Statement neck piece, Pink N Brown Elaborate neck adornment, Runway Dress Topper, One of a Kind. Showstopper Bridal/Prom Accessory, Formal occasion Necklace. 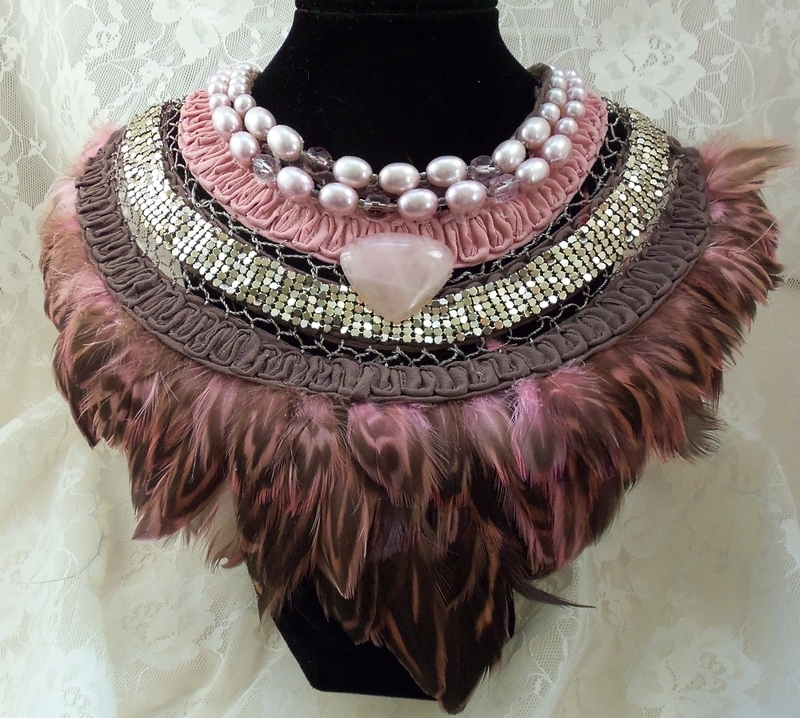 Layers and layers of pink and brown feathers carefully places all long the bottom of a exquisite vintage neck piece. Soft pink vintage beads and crystals cascade across the top with a beautiful gemstone placed just below compliment them perfectly. The mix of the soft feathers, metal mesh, twisted fabric and polished stone come together flawlessly on this work of art collar/necklace. It measures 7 inches wide in the center and is 18 inches around. The length can be adjusted to your exact size.